Bangert, U., Pierce, W., Ramasse, Q.M.et al.,, Nano Letters 13 (2013), pp. 4902-4907. Pan, C.-T., Hinks, J.A., Ramasse, Q.M., Greaves, G., Bangert, U., Donnelly, S.E. and Haigh, S.J. Submitted (2014). Susi, T., Kotakoski, J., Kepaptsoglou, D., Mangler, C., Lovejoy, T.C., Krivanek, O.L., Zan, R., Bangert, U., Ayala, P., Meyer, J.C. and Ramasse, Q.M. Submitted (2014). Ramasse, Q.M., Seabourne, C.R., Kepaptsoglou, D.M., et al., Nano Letters 13 (2013), 4989-4985. Hage, F.S., Ramasse, Q.M., Kepaptsoglou, D.M., et al., Physical Review B 88 (2013), 155408. 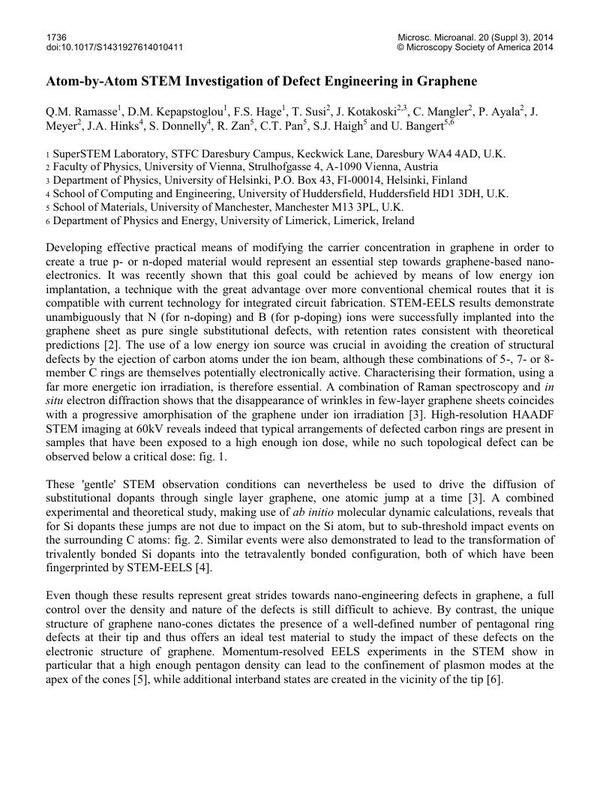 Hage, F.S., Kepaptsoglou, D.M., Seabourne, C.R., et al., Nanoscale 6 (2014), p. 1833-1839. SuperSTEM is funded by the UK Engineering and Physical Sciences Research Council (EPSRC).